Citing sources with knowledge of Apple's supply chain, DigiTimes says wireless chip manufacturers are expecting a boost in parts orders when AirPower becomes available later this year. The report claims Lite-On Semiconductor began shipping glass passivated package (GPP) bridge rectifiers for use in the assembly of finalized AirPower units more than a year ago. Orders for the component remain "insignificant" but steady, though volumes are expected to greatly increase later this year when the device goes up for sale, sources said. DigiTimes has in the past provided reliable information on parts delivery timelines pertaining to specific Asian suppliers, but the publication has a mixed track record when it comes to Apple's product wider launch plans. As such, AppleInsider is unable to vouch for the veracity of today's report. The new information lines up with a recent rumor claiming existing Apple supplier Luxshare Precision initiated AirPower production in early January. Exact details of the production run, including when the device will hit store shelves and in what quantities, remains unknown. Apple announced AirPower alongside iPhone 8, 8 Plus and X in 2017, marketing the device as an all-in-one power delivery solution for the company's portable products. 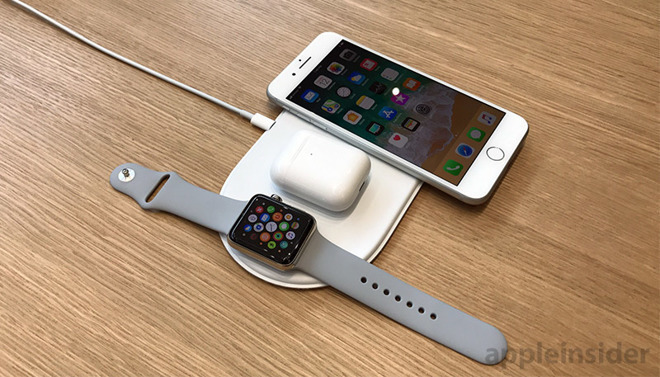 The wireless charger incorporates in-house developed technology that enables simultaneous charging of multiple devices including Qi-compliant iPhones, Apple Watch and an as-yet-unreleased AirPods wireless charging case. Expected to launch with iPhone XS and XR last year, AirPower ultimately missed a slated 2018 release. Rumors at the time pinned the delay on unforeseen heat and interference issues. Apple has remained mum on the product's fate and the company scrubbed nearly all mention of AirPower from its website last September following its annual iPhone event.